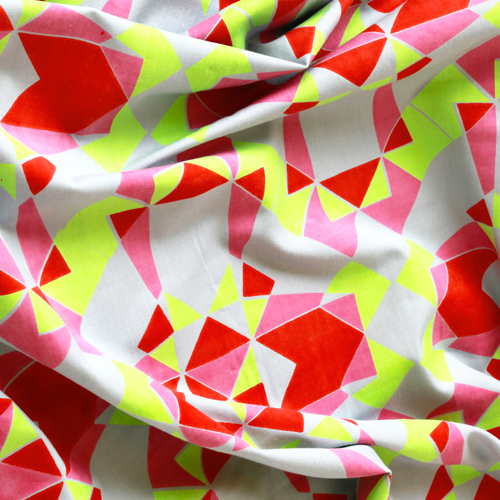 Victoria Umansky creates expressive and vibrant prints on organic fabrics designed for interiors. There is an expression and energy to her geometrics that bely a young artist who may be embarking on a total work of art vision. The gesamtkunstwerke methodology echoes another kind of ‘interiors’ environment that describes a whole vision in much the same way as Theo van Doesburg, Edouard Vuillard and Yayoi Kusama have pursued, albeit in very different ways. Here is an artist who, much like others in The Geometrics such as Camille Walala, Marie Molterer and Marie O’Connor create geometric environments in which to interact, live and play. For more on her work and inspiration see The Geometrics: Volumes 2. Recent exhibitions include Clerkenwell Craft and New Designers, London, 2013.